As I wasn't able to go anywhere because of my injury I spent at least the sunny hours sitting outside the cottage with my leg up. While sitting there I sometimes watched the Swallows (and other birds) during their daily activities. At some point I decided to get the camera out to try to catch some in flight. Having watched them I had a reasonable idea of their flight paths. 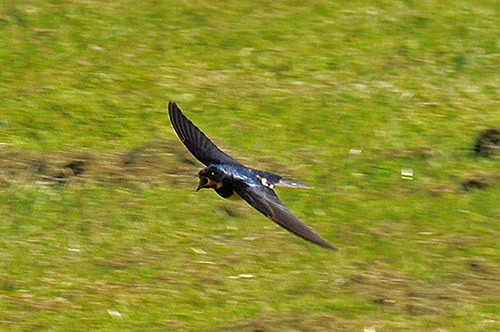 Still, with their amazing speed I found it was almost impossible to track and photograph them. This is one of the better efforts. That's all I have for tonight, good night and have a great weekend!